Rack and Pull motorcycle collision and frame repair is Northern California's premier motorcycle collision center, specializing in Harley Davidson frame repair. We are approved by all major insurance companies. We can repair your damaged motorcycle from start to finish with unsurpassed quality, laser accuracy and integrity. We offer a life time warranty on our frame repair and workmanship. 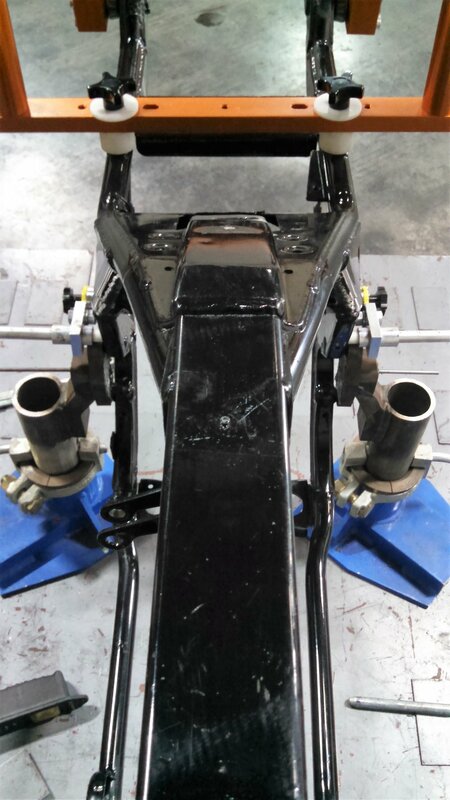 No other shop has the equipment to do the repairs that Rack and Pull can do for you. Rack and Pull uses the Straight Shooter, the only live laser measuring system in the world to give visual confirmation of frame damage or miss-aligned rear suspension, one of the causes of the infamous and dangerous Harley wobble. The Straight Shooter will eliminate the guess work with frame damage assessment. This measurement is laser accurate and can be performed efficiently with minimal parts removed to help keep cost down and prevent you from paying for unnecessary repairs. It's a well known fact that most people who own Harley Davidson motorcycles will put thousands of dollars into their bike and if an unfortunate incident happens and they have to file an insurance claim the owner usually comes out on the short end of the stick. We've all heard horror stories about someone having their bike totaled at a dealership because the dealership said there was frame damage when in fact nobody was able to show proof of the frame damage. The poor customer was left stunned and holding the bag, still owing money on the totaled bike and a large balance on a credit card used to accessorize the totaled bike. Don't let this happen to you! The law in California states you have the right to take your motorcycle to the shop of your choice! Don't let a dealership take advantage of you. Most dealerships are more concerned about their sales than they are about customer retention or your financial concerns. They don't care how bad you come out of the deal, they would rather sell you a new bike than repair the one you have. 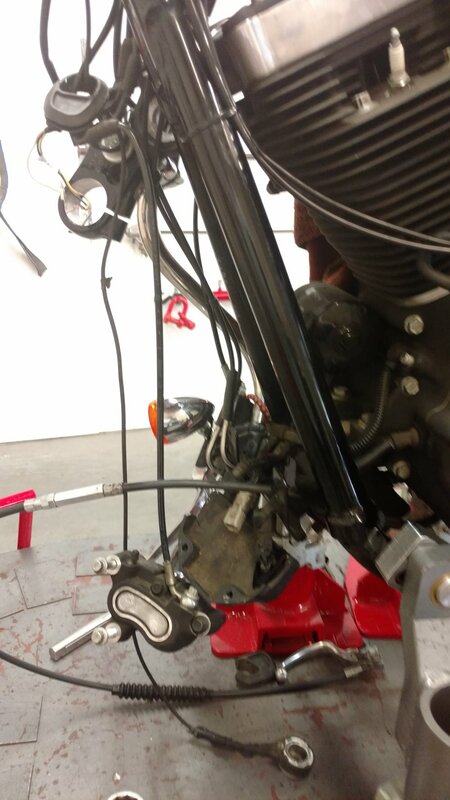 Our certified motorcycle frame technician has the equipment, experience and knowledge to bring your motorcycle frame back to the way it was when it was brand new and in some cases, even better! We have The Rack, the only ride up motorcycle frame rack that can also be used as a service rack. 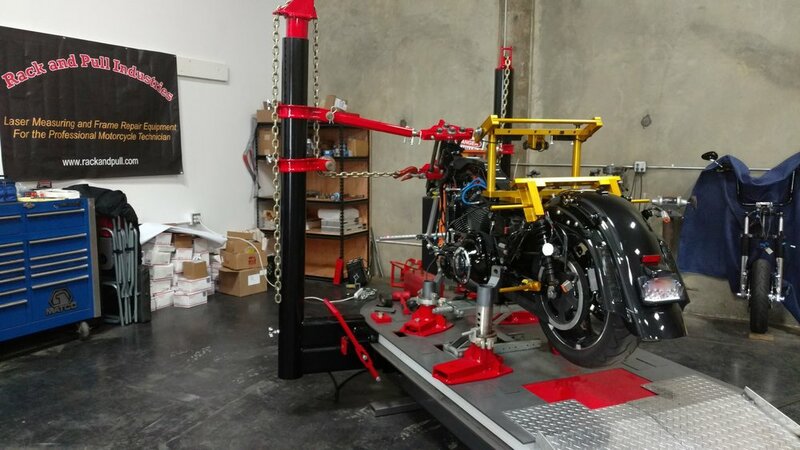 If the motorcycle is too damaged to ride then it can be put a dolly and safely winched up to the frame rack and securely attached to The Rack for precision repairs. Come to Rack and Pull Collision Center for all your motorcycle collision or frame repair needs, or if you need help dealing with an insurance claim or estimate, or if you have a poor handling motorcycle. Rack and Pull Industries and Collision Center, where quality, honesty and integrity come first!